Thinking of exploring holistic medicine as an alternative way to manage your dog or cat’s health needs? If so, the book “Releasing Your Pet’s Hidden Health Potential is a great place to begin. 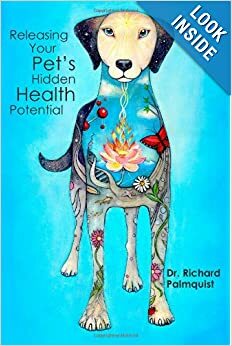 Written by the highly respected holistic veterinarian Dr. Richard Palmquist, this book is a comprehensive guide to utilizing the power of nutrition and holistic modalities such as acupuncture, muscle response testing, and stem cell therapy to help your pet live a long, healthy life. Releasing Your Pet’s Hidden Health Potential presents a layperson’s introduction to a dog or cat’s body systems and how proactive nutrition management can help them get the most out of life at any age. You’ll learn about the keys to a healthy diet, and how to naturally recover from disease if it occurs. It is a comprehensive guide for any pet parent who wants to do all they can to avoid disease in their pets. We haven’t had an opportunity to check out this book ourselves but hope to read it cover to cover soon. If you read it, please let us know your thoughts! Dr. Palmquist is Chief of integrative health services at Centinela Animal Hospital in Inglewood, California. He is the founder of the American Holistic Veterinary Medical Foundation, the only organization supporting education, research and scholarships in holistic veterinary medicine. His passion for holistic veterinary medicine occurred early in his career when he studied the work of Dr. Marty Goldstein, DVM, an early advocate for holistic veterinary care who converted Palmquist from a skeptic to a fan of alternative medicine. After his encounter with Dr. Goldstein, he began to experience the positive effects of natural treatments on clients for treating everything from allergies to cancer. Today his younger counterparts use his textbook, “Integrating Complementary Medicine into Veterinary Practice” as a foundation for their own treatment approaches. Veterinary Practice News: Two Side of One Coin: Integrative veterinarian Richard Palmquist uses an East-meets-West approach in his practice. Wow, looks like a good read!